St. Luke tells us that, “The word of God was spoken to John the son of Zechariah in the desert” (Luke 3:2). The word came not to one of the high and mighty, or one of the lords of society, living in an impressive palace or temple. It came to John in the desert. And that word tells us that God is about to act. Just as he brought his children home from exile in Babylon, so now he is going to bring them back from an interior, spiritual exile. John speaks: “Make ready the way of the Lord, clear for him a straight path. Every valley shall be filled and every mountain and hill shall be leveled. The windings shall be made straight and the rough ways smooth” (Isaiah 40: 3-4). John is saying that his job is to prepare for the mighty coming of the Lord. He is to build the highway that will facilitate his arrival. Change is coming, a revolution is on the way. So prepare the way of the Lord. And how should we prepare? Through the baptism of repentance. Baptism—an immersion in water—reminded first century Jews of the Exodus, passing through the Red Sea, leaving their ways of slavery behind. Baptism reminded the people that God would humble the powers of their time as he once humbled Egypt and Babylon. Repentance (metanoia) means going beyond the mind that you have. How our minds are conditioned by the fallen world! How our expectations are shaped, stunted by what has gone before! It’s time, John is saying, for a new mind, a new set of eyes, a new kind of expectation. God is about to act! Be ready! "Dunn is a former sheriff’s deputy and has worked as a Homeland Security officer but had no health insurance when he got sick. 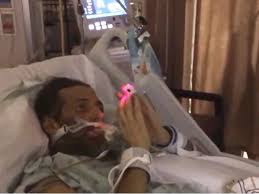 He has been in the hospital for eight weeks since a noncancerous mass was found where his small intestine connects to the pancreas." Dunn’s mother believes that decision was influenced by the fact that Dunn has no health insurance. Texas is one of the few states that allows a panel to determine the life and death of patients when there is disagreement between the patient’s physician and their family or the patients themselves. Under Texas law, if an attending physician refuses to honor a patient’s requests for care or an advance directive, that decision then goes before an ethics or medical committee. Dunn’s lawer believes that the Texas statute denies a patient all due process rights and is unconstitutional. “A criminal on death row in Texas has more rights than a patient in a Texas hospital" he said. A Harris County judge has granted two consecutive two-week extensions thus far, but Houston Methodist Hospital has countered these interventions with additional court filings to remove Chris’s mother from the process. His mother, Evelyn, has been vigilant in protecting Chris since he is intermittently sedated. Questions that have to be asked: Does a Homeland Security Officer not have health insurance? Did the attending physician refuse to attend to him because of this? Blogger: This is where Christian anthropology must emerge from the penumbra from where it undergirds the entire moral and legal structure of society. This situation is the same as the parable invented by Christ to teach the human-divine story of the Good Samaritan attending to the injured Jew - unknown to him, and to whom he has no natural ties - while passed by by his co-religionists on their way to obey the Mosaic law in the temple.